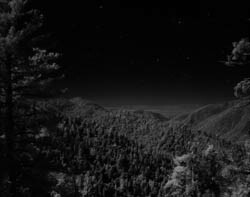 Florian Maier-Aichen’s images reinterpret landscape photography for the 21st century. Often shot at obscure angles or from aerial views, his estranged vantage points are both alien and familiar; a sensation enhanced by his subtle manipulation of the images. Conceiving the representation of sites with a sense of dislocation, Maier-Aichen’s work addresses issues of globalisation and virtual perception. In Untitled, Maier-Aichen’s coastline is far from postcard perfect: a virgin beach lined with superhighway and luxury homes expanding into the misty distance. 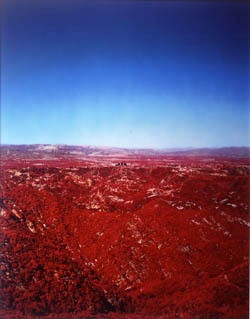 Tinting the surrounding forest in an unnatural shade of red, he casts an apocalyptic glow over the seascape, framing wilderness and human intervention as a scene of science fiction portent. Supplanting the expanses of classical vistas with futuristic tableaux, Florian Maier-Aichen recontextualises the romantic sublime to reflect modern day experience. Using a combination of traditional photographic techniques and computer imaging, Maier-Aichen slightly alters each image to heighten the tension within vast contemplative space. 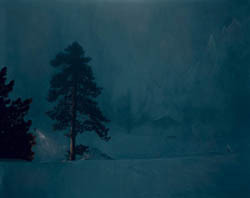 Maier-Aichen’s Untitled takes as its theme the American wilderness as conceived through 19th century painting. Through his lens, the unharnessed frontier with its associated promise and divine inspiration is transformed with unnerving effect. Impossible lighting conditions, too-manicured composition, and strange mushroom clouds give the landscape an aura of eerie expectancy. Subverting the expected documentary quality of photography, Florian Maier-Aichen approaches his medium as a form of painterly illusion. 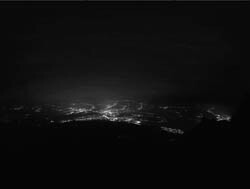 Adopting his process as a means to ‘draw with light’, his photos blur fact and fiction, creating ominous evidence of a rapidly changing planet. 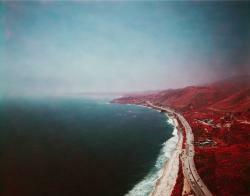 Barren of conspicuous landmarks Maier-Aichen’s Untitled is an anonymous anywhere space. 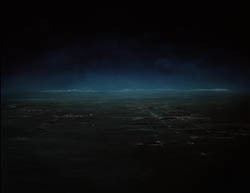 The receding grid pattern of lights weighs the composition with a dulled sleepiness, as the horizon seems to encroach in an electric blue haze. Shot from an extreme angle, Maier-Aichen’s landscape verges on the abstract; the unnatural phenomenon reading as subtle shifts of colour and texture, replicating the sublime intensity of colour-field painting. Combining analogue photography with digital editing techniques, Florian Aichen-Maier revives an intrigue of technology and metaphysics; the effects of his process reveal ‘unseen truths’ or a sense of mysticism about his represented images. In Untitled, Maier-Aichen’s snow-scape exudes an eerie loneliness, encapsulating the deafening stillness of a winter’s night in its cool blue tint and greeting card romanticism. The unlikely presence of a street lamp amidst the trees gives strange illumination to the falling snow, giving an unsettling suburban presence to the desolate scene. In Above June Lake, Florian Maier-Aichen presents an aerial view of the popular California tourist destination. Trading on the area’s celebrated 5 million year old geological heritage, Maier-Aichen’s photograph transforms the topography into something strangely primitive. 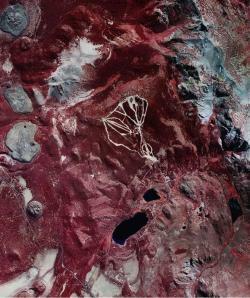 Pin point trees, smooth glaciers, and contoured rock connote a biological animation, carved through with vein-like roads, and infectious microscopic houses. Scrutinised with alien perspective, evidence of development and luxury become etched upon the terrain as crude scratchings as the artificial white outline of ski-slopes attain the brutal elegance of cave painting. Florian Maier-Aichen’s work appropriates the genre of landscape photography to reconsider its associations with environment, documentation, and exoticism. Using the malleability of photographic editing, Maier-Aichen’s Untitled (Long Beach) transforms a familiar view of metropolitan America into an apocalyptic wasteland. 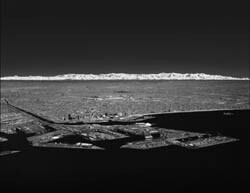 Printed in black and white, urban sprawl appears as ashy barrens, receding to foreboding ice mountains superimposed in the distance. Rendering sky and sea as empty voids, Maier-Aichen’s vision of unfolds as futuristic desert. Florian Maier-Aichen works with varying degrees of "straight" photography and digital intervention to create work that challenges our visual understanding of the photographic image. Florian Maier-Aichen's photographs oscillate between landscapes of incredulous sublimity and depictions of uncannily plausible catastrophes.